The catechesis on the sacrament of Baptism leads us to speak today of the holy washing accompanied by the invocation of the Most Holy Trinity, that is the central rite which properly "baptizes" - that is, immerses - in the Paschal Mystery of Christ (cf. Catechism of the Catholic Church, 1239). The meaning of this gesture reminds St. Paul to the Christians of Rome, at first asking: «Do you not know that we were baptized in Christ Jesus, we were baptized in his death?», And then answering: «We were buried through baptism together with him in death so that as Christ was raised from the dead, so we too can walk in new life "(Rom 6: 4). Baptism opens us the door to a life of resurrection, not to a worldly life. A life according to Jesus. The baptismal font is the place where Easter is celebrated with Christ! The old man is buried, with his deceitful passions (cf. Eph 4:22), so that a new creature may be reborn; indeed old things have passed away and new ones have been born (cf. 2 Cor 5:17). In the "Catechesis" attributed to St. Cyril of Jerusalem, the newly baptized is explained to them what happened to them in the water of Baptism. This explanation of St. Cyril is beautiful: "In the same instant you are dead and born, and the same wave of health became for you and the sepulcher and mother" (No. 20, Mistagogica 2, 4-6: PG 33, 1079-1082) . The rebirth of the new man demands that man corrupted by sin be reduced to dust. The images of the tomb and of the womb referred to the source, are in fact very incisive to express what is great through the simple gestures of Baptism. 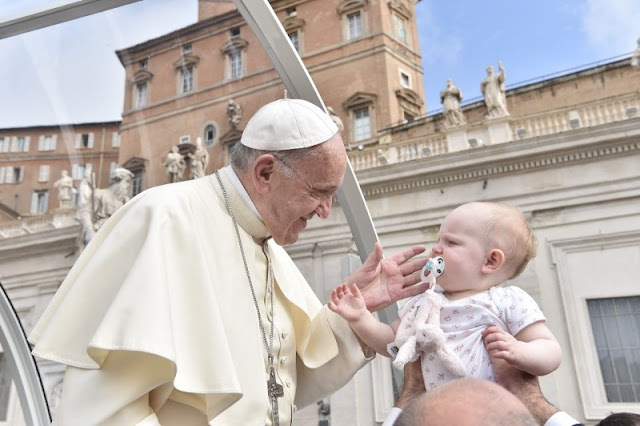 I like to mention the inscription found in the ancient Roman baptistery of the Lateran, in which we read, in Latin, this expression attributed to Pope Sixtus III: "The Mother Church gives birth to virgin water through the children who conceives by the breath. of God. How many have been reborn from this source, hope for the kingdom of heaven ". It is beautiful: the Church that gives us birth, the Church that is womb, is our mother through Baptism. If our parents have given us life on earth, the Church has regenerated us to eternal life in Baptism. We have become children in his Son Jesus (cf. Rom 8:15, Gal 4: 5-7). Also on each of us, reborn from the water and the Holy Spirit, Heavenly Father makes his voice resound with infinite love that says: "You are my beloved child" (cf. Mt 3:17). This paternal voice, imperceptible to the ear but well audible from the heart of those who believe, accompanies us throughout life, without ever abandoning ourselves. Throughout his life the Father tells us: "You are my beloved son, you are my beloved daughter". God loves us so much, like a Father, and does not leave us alone. This from the moment of baptism. We are forever, Reborn children of God! Baptism does not repeat itself, because it imprints an indelible spiritual seal: "This seal is not erased by any sin, although sin prevents Baptism from bringing fruits of salvation" (CCC, 1272). The seal of Baptism is never lost! "Father, but if a person becomes a brigand, of the most famous, who kills people, who makes injustices, the seal goes away?". No. For his own shame the son of God who is that man does these things, but the seal does not go away. And he continues to be a child of God, who goes against God but God never denies his children. Did you understand this last thing? God never denies his children. Do we repeat it all together? "God never denies his children". A little louder, that I am either deaf or I have not understood: [repeat more strongly] "God never denies his children". Here, that's okay. Incorporated to Christ through Baptism, the baptized are therefore conformed to Him, "the firstborn of many brethren" (Rom 8:29). Through the action of the Holy Spirit, Baptism purifies, sanctifies, justifies, to form in Christ, of many, one body (cf. 1 Cor 6:11, 12, 13). This is expressed in the chrismal unction, "which is a sign of the royal priesthood of the baptized and of his aggregation to the community of the people of God" (Rite of the Baptism of Children, Introduction, No. 18, 3). Therefore the priest anoints with the sacred chrism the head of every baptized person, after having pronounced these words that explain its meaning: "God himself consecrates you with the chrism of salvation, because inserted into Christ, priest, king and prophet, always be members of his body for eternal life "(ibid., 71). Brothers and sisters, the Christian vocation is all this: living united to Christ in the holy Church, participating in the same consecration to carry out the same mission in this world, bearing fruits that last forever. Animated by the one Spirit, in fact, the entire People of God participates in the functions of Jesus Christ, "Priest, King and Prophet", and carries the responsibilities of mission and service that derive from them (cf. CCC, 783-786). What does it mean to participate in the royal and prophetic priesthood of Christ? It means making oneself a welcome offering to God (cf. Rm 12: 1), bearing witness to him through a life of faith and charity (cf. Lumen Gentium, 12), placing it at the service of others, following the example of the Lord Jesus (cf. Mt 20: 25-28; Jn 13: 13-17). Je salue cordialement les pèlerins de langue française, en particulier les personnes venues du Canada et de France. Frères et sœurs, souvenons-nous chaque jour de notre vocation baptismale en faisant de notre vie une offrande agréable à Dieu et en la mettant au service des autres. Que Dieu vous bénisse. I greet the English-speaking pilgrims and visitors taking part in today's Audience, especially those from England, Finland, Indonesia, the Philippines, Canada and the United States of America. In a special way, I greet the "small farmers" from various countries meeting in Italy, with gratitude for their contribution to feeding our world. In the joy of the Risen Christ, I invoke upon you and your families. May the Lord bless you all! Mit Freude heiße ich die Pilger deutscher Sprache willkommen. Insbesondere grüße ich die Grabesritter der Komturei St. Hildegard and die Schwestern vom Göttlichen Erlöser, die ihr 25-jähriges Professjubiläum feiern. Als Getaufte sind wir wiedergeboren zu einem neuen Leben in Christus und berufen, seine Sendung weiterzuführen, indem wir seine Liebe und sein Evangelium zu unseren Mitmenschen bringen. Von Herzen marks ich euch alle. Queridos peregrinos de língua portuguesa, bem-vindos! Saúdo cordialmente os vários grupos paroquiais, os Missionários Redentoristas e a Família Franciscana do Brasil, bem como os membros do Instituto para o Desenvolvimento Social, de Lisboa. Que esta peregrinação fortaleça nos vossos corações o sentir e o viver com a Igreja, perseverando na reza diária do terço. Podereis assim reunir-vos quotidianamente com a Virgem Mãe, aprendendo d'Ela a cooperar plenamente com os desígnios de salvação que Deus tem sobre cada um. O Senhor vos abençoe, a vós e aos vossos entes queridos. أُرحّبُ بالحجّاجِ الناطقينَ باللّغةِ العربيّة، وخاصّةً بالقادمينَ من الشّرق الأوسط. أيّها الإخوة والأخوات الأعزّاء، إنَّ شهر أيّار مُخصّص لتكريم العذراء، أدعوكم لتنمية التعبُّد لوالدة الله من خلال تلاوة مسبحة الورديّة يوميًّا رافعين الصّلاة بشكل خاصّ من أجل السّلام في سوريا والعالم بأسره. ليبارككُم الرّبّ! Serdecznie pozdrawiam polskich pielgrzymów. Drodzy bracia i siostry, wczoraj Kościół w Polsce świętował uroczystość waszego Patrona św. Stanisława Biskupa i Męczennika. Oddał życie jako obrońca Ewangelii, wartości moralnych i godności każdego człowieka. Jego heroiczny przykład niech będzie dla was wszystkich drogowskazem w waszej codzienności, w życiu osobistym, rodzinnym i społecznym. Niech jego wstawiennictwo wspiera was w podążaniu drogami prawdy i miłości. Niech Bóg wam błogosławi! I offer a cordial welcome to Italian-speaking pilgrims. I am pleased to welcome the participants to the General Chapters of the Sisters of Our Lady of Mercy; of the Missionary Daughters of Calvary; of the Franciscan Missionary Sisters of the Child Jesus and of the Franciscan Servants of Mary. I encourage everyone to be faithful to Christ so that, by the example of Mary Most Holy, you can make the joy of the Gospel shine. I greet the Community of Borgo Ragazzi Don Bosco in Rome, the parishes, in particular those of Salerno and Preturo di Montoro; the Association of Lay Love of Mercy; the young people of Civitanova Marche and the groups of students, particularly those of Florence and Gioia del Colle. A special thought I address to the young, the elderly, the sick and the newlyweds. We are in the month of May, a time dedicated to the Blessed Virgin Mary. Cultivate devotion to Our Lady, with the daily recitation of the Rosary, so that as the Mother of God, accepting the mysteries of Christ in your life, may you increasingly be a gift of love for everyone. Thank you.